1. After Staggering Defeat, Will Pacers Rise Up? INDIANAPOLIS -- The Indiana Pacers spent the days leading up to Game 1 of their first-round matchup against the Atlanta Hawks talking about being refreshed physically and mentally. This was their moment to start over and put the final four weeks of the season behind them. But in a matter of minutes in the third quarter Saturday, the Pacers proved yet again why claims of a turnaround are flimsy. More importantly, in that short period of time, they lost home-court advantage, something they spent all season talking about. In a score that was far worse than the final outcome -- 101-93 -- the Pacers walked off the court in typical fashion of late: with their heads down and only themselves to blame as they trail their best-of-seven series to Atlanta 1-0. "We didn't play nearly well enough to beat this basketball team, on either end of the court," Pacers coach Frank Vogel said. Andy Lyons/Getty Images Pacers center Roy Hibbert had another lackluster performance in the Game 1 defeat. The Pacers tried to downplay their second bad performance against the Hawks in less than two weeks. Point guard George Hill said it's not like the NCAA tournament, in which it's a one-and-done format. That's true, but they needed the victory worse than Atlanta. The Hawks are the underdogs. They're the team that's not supposed to have a chance as a No. 8 seed. This is all about the Pacers. Nobody else. Vogel has spent the past two weeks in scramble mode, desperately trying to figure out a way to get his team out of its late-season funk. He gave the starters practice off. He gave the starters a game off. He even rested three starters and played Roy Hibbert and Hill, the two starters who struggled the most of late, in an attempt to get them going. That has turned out to be futile so far. Indiana won three of its four games to close out the regular season. Two of those victories were with backup players. "Of course I'm disappointed," Pacers swingman Paul George said. "Especially after the game they played previous to this one. We know how they can play when they're on their A-game." The Pacers appear to be a vulnerable top seed, even against an Atlanta team that finished the season 38-44. Hill, George, David West and Rasual Butler were still in uniform huddled together talking about the game after the media entered the locker room. "We just have to stay the course," West said. "Obviously, we have to make them guard us and defend us. We're just fouling too much and not being solid and making them score over us." The Hawks took control of the game in the third quarter, using a 14-0 run to take 74-58 lead after West and Atlanta center Pero Antic got tangled up, exchanged words and received double technicals. A sign of things to come, though, happened late in the second quarter. The Pacers missed three straight free throws in the final 62 seconds, then George tried to get cute with the ball by dribbling between his legs several times only to have Cartier Martin steal it, and Kyle Korver tipped in Jeff Teague's miss to tie the game at 50-50 as the half ended. The third quarter was just where the Pacers fell apart. They finished the regular season as the league's most efficient defense, but the Hawks -- more like Teague and Paul Millsap -- scored whenever they wanted against Indiana. Teague, who is from Indianapolis, didn't need any screens to get into the paint. He beat them off the dribble and scored 14 of his 28 points in the third quarter. Millsap had 13 of his 25 points also in the quarter. The larger their deficit, the worse the body language got for the Pacers. Vogel got so desperate that he went with a small lineup that featured West as the center midway through the fourth quarter when the team trailed by 17 points. "We're fighting uphill," West said. "We can't allow teams to go on that type of run. We have to make some adjustments on how we're defending them. 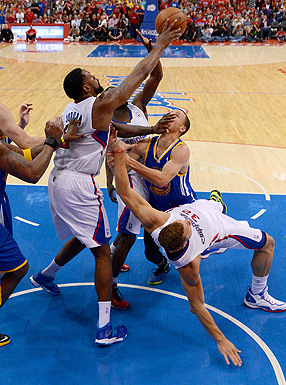 We have to guard, too, without fouling. Make them take shots. We didn't do a good enough job tonight." Vogel plans to stick with the same starting lineup in Game 2, but at some point -- hopefully sooner than later -- he's going to have make a decision on whether to keep Hibbert as his center, because he's not producing and their season continues the downward spiral. "We're going to be OK," Lance Stephenson said, entirely unconvincing, with his voice lowered as he headed toward the shower. MVP: Kevin Durant. At this point, we really shouldn't be surprised by Durant's brilliance, but it seems as if every game he finds some new way to astonish us. Against the Grizzlies, he had 33 points, none more spectacular than his under-the-rim layup late in the fourth quarter. X factor: Steven Adams and Serge Ibaka's rim protection was invaluable. The duo combined for seven of the Thunder's 10 blocks. Defining moment: Down 21 at halftime, the Grizzlies stormed back to within two points with 8:45 to go in the fourth. But the Thunder responded, going on a 13-1 run to put the game out of reach for good. MVP: Jeff Teague sliced and diced his way through the Pacers' defense for 28 points. Teague had 14 points in the pivotal third quarter, in which the Hawks outscored the Pacers 30-16. 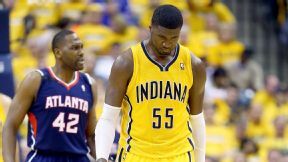 LVP: Roy Hibbert 's final stats -- eight points, eight rebounds -- do not begin to reflect how poorly Indiana's big man played. Through three quarters, Hibbert had only two points, three turnovers and was a game-worst minus-23. shocking: Even with most predictors giving the Hawks a puncher's chance at winning a couple of games, blowing the Pacers out for most of the second half was something else. The Hawks now have home-court advantage for the series. MVP: The Raptors had no answer for "Iso" Joe Johnson this afternoon. The Nets dealt with foul trouble, struggling veterans and an abysmal showing from beyond the arc (3-for-24), but Johnson was the steady hand, leading Brooklyn with 24 points, eight rebounds and four assists. X factor: Paul Pierce struggled in the early going, but in the fourth quarter, "The Truth" suited up. Nine of Pierce's 15 points came in the fourth, in the form of run-stoppers, crowd-silencers and late daggers. a 19th century revisit. The shot clock stopped working midway through the game, prompting the Raptors PA announcer to count down from 10 seconds and -- you guessed it -- announce "horn!" at buzzer time. I guess things work differently in the north. MVP: Klay Thompson. Often miscast as solely a shooter, Thompson added seven rebounds, five assists and stellar defense on Chris Paul to his 22 points. With Stephen Curry struggling and Andre Iguodala in foul trouble, the Warriors needed someone to step up, and Thompson did. Defining moment: Draymond Green grabbed an offensive rebound off a Curry jumper and was quickly fouled by Darren Collison with 24 seconds left. His ensuing free throws sealed the game and epitomized the Dubs' second-half rally. a slugfest: Talk about a letdown. This series was billed as the most entertaining to watch, but 51 fouls and 60 free throws slowed the game's pace to a crawl. If not for 21 combined 3-pointers and some late-game drama, this would've been a snore. Jeff Teague, Hawks: The Indianapolis native scorched his hometown Pacers with 28 points in the 101-93 win over the East No. 1 seed. While his teammates spread the floor, Teague drove with impunity to the hoop, giving the Hawks their first road playoff win in three years. Indiana Pacers: Is it any comfort for the Pacers that the eventual 2008 NBA champion Celtics were taken to seven games by a No. 8 seed Hawks team? Probably not. The Pacers are down 1-0 after the 101-93 loss to Atlanta. If Indy has anything left up its sleeve, now is probably the time to use it. -- Raptors GM Masai Ujiri, at a fan rally outside Air Canada Centre prior to Game 1 loss to the Brooklyn Nets. Jayne Kamin-Oncea/USA TODAY Sports Possible to imagine the Warriors winning a road playoff game while Stephen Curry was essentially muzzled? It happened, with the help of Klay Thompson (22 points). It would be historic if Indiana or Miami turned things around and went on to win the NBA title. The Pacers went 12-13 over their last 25 games, while the Heat were just 11-14. Only two teams in NBA history finished with a sub-.500 record over their last 25 games of the regular season and then went on to win the title (1957-58 Hawks and 1994-95 Rockets).